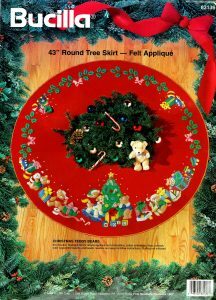 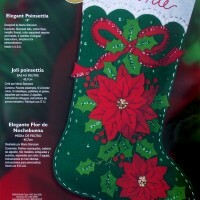 Bucilla Christmas Teddy Bears ~ 43" Felt Tree Skirt Kit #83136 Toys, Gifts Santa - FTH International Sales Ltd. 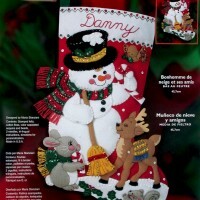 This is a discontinued 1994 pattern so if you love it please make sure you don’t miss the chance to purchase this rare and hard to find kit. This tree skirt kit features five busy little Teddy Bears working hard to get ready for Christmas. 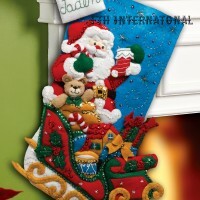 While several of them are working on the gifts that are sprinkled all around the outside edge of the skirt, one of them is putting the finishing touches on the Christmas tree in the front of the skirt while the last little bear is going for a ride on the little rocking horse in front of the tree..
Wether you use this tree skirt under the tree or as a table cover to help create, or dress up, a focal spot over the holidays it is bound to draw a lot of attention from friends and family.